With the Humble Image Bundle in its final week, I thought I would reread a series that I have always found to be a lot of fun. After rereading the first trade for Invincible, I decided to do a little review and maybe the start of a weekly article. Fly past the jump to see what I thought of Invincible Volume 1 – Family Matters. Created by Robert Kirkman (The Walking Dead) and Cory Walker (SuperPatriot) and Invincible released in 2003 for Image Comics (later under the Skybound Entertainment imprint). While Kirkman is widely known for his ever popular series, The Walking Dead; Kirkman stole the spotlight with his ongoing Invincible series. Cory Walker would be the artist for the series up to issue #8, after which Ryan Ottley would take over. Invincible would go on to be one of Image Comics’ most successful series even to this day, spawning a few of its own spin-offs. “Family Matters” covers the first four issues of Invincible. 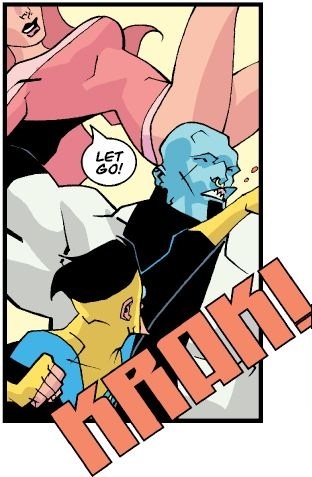 The story of Invincible is pretty standard; following the adventures of Mark Grayson, half-alien offspring of Omni-man. We watch as Mark learns what he’s capable of, deciding on the alter-ego of Invincible, team up with other teen heroes and later his own father, and even process life as a normal teenager. How does create a hundred-plus issue series? Because it’s funny and visually exciting. Robert Kirkman brings a fresh perspective into the young hero genre of comics. Kirkman writes Mark as young man who relishes the fact that he’s gaining superpowers. Too often we read stories were the young hero is scared or unsure of what to do next, whereas Mark is thrilled in becoming Invincible. Yes, there are moments where Invincible second guesses what his next move should be but he is quick to follow up. Kirkman’s story of teenage boy trying to follow in his father footsteps allowed readers to relax and have fun. Invincible did not feel heavy and buried readers in over dramatic themes. Cory Walker livened the story with dynamic art that you could hear in every panel. With stylized lines and simple faces, Walker brought out the wide arrange of emotions that teenagers feel from confusion to outright boredom. Walker’s onomatopoeia helped readers feel every strike from this new super powerhouse, with effect breaking panels and taking over backgrounds. As much as I enjoy Ryan Ottley’s art, after rereading this book I started to miss Cory Walker a lot more. Invincible is a fun comic that boils down what being a young superhero is all about, although the book definitely does not fall under the “All-Ages” category especially with what occurs in the next volume of the series. 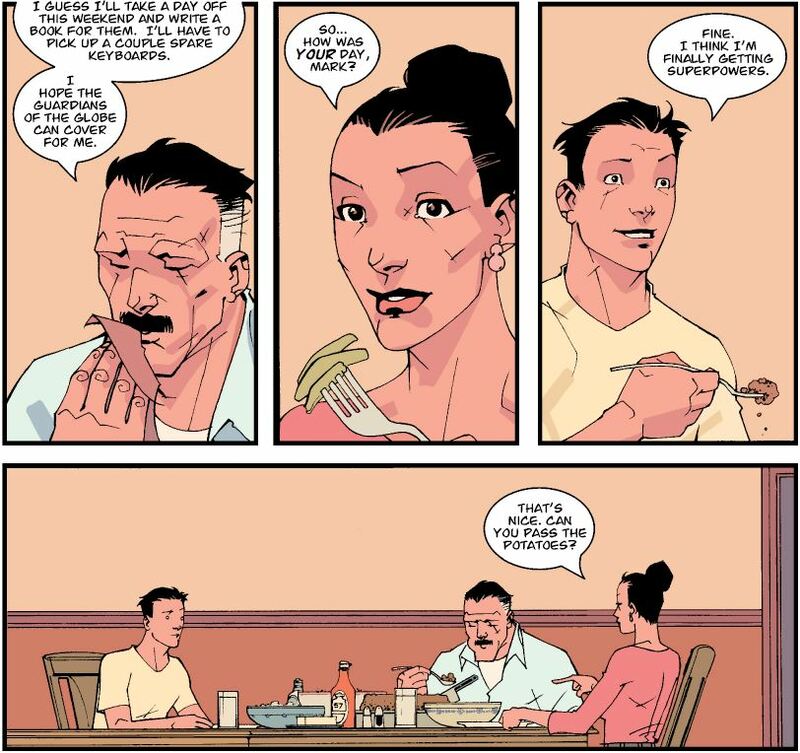 If you have not read Invincible and want an easy superhero book, then “Family Matters” is a great start. You can pick up the first trade digitally in the Humble Image Bundle (going for the next four days); physically here or your local comic book store. I may also recommend picking up the “Ultimate Collection” that collect the first three trades; also available here or your local comic book store. If you haven’t read the series and just picked it up, let me know what you think. Or even if you have read the series, drop on by and speak your mind.